The changes made to the company's online presentations are strong. Now, it is time for advice. Remember that time Nintendo launched a popular product and then immediately ceased production? 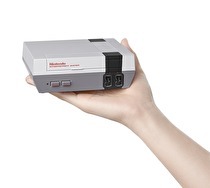 Nintendo has ceased production of the incredibly hard to find NES Classic, and I can't stop laughing. I should be mad at a company that made it very difficult to find a product that I absolutely wanted, but instead I'm so beyond incredulous that I can't be mad. Nintendo has made possibly the most Nintendo-like move of all time in ceasing production of probably its best-received product since the original Wii.